The tiny castle of Lindisfarne, sits on the top of a rocky outcrop at the South Eastern tip of Holy Island. The outcrop on which the castle is sited is called Beblowe Crag, and provides the buildings with firm foundations. 16th century maps show that there was a beacon on the summit of the crag before the castle was built. It wasn't until 1550 that the fortification was completed. The building materials for the castle were most likely pillaged from the nearby Priory when it was dissolved under Henry VIII's orders. The castle was at the forefront of Anglo Scottish aggression, and in 1542 Henry VIII ordered the site to be fortified against possible Scottish attack. As a result of this Royal order the castle was built, and provided with an impressive array of artillery. Above. 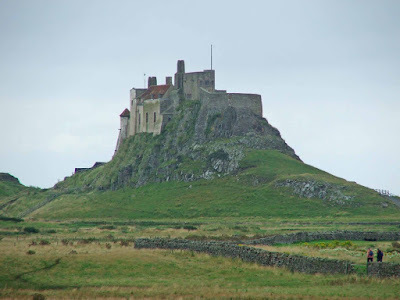 Lindisfarne Castle from the North. During the Jacobite uprisings, the castle was briefly held by the Pretender's supporters. When the garrison was removed, the castle briefly found use as a coast guard lookout and tourist attraction during the latter part of the 18th century. In 1901, the castle was bought by Edward Hudson who took it upon himself to refurbish his new acquisition, employing the architectural skills of Sir Edwin Lutyens. Photo courtesy of Malcolm Booker.